Handmade wreaths are an inexpensive way to change your decor up throughout the seasons and keep things looking fresh. They’re also a great way to add a personal touch to your home because no two are going to be the same. 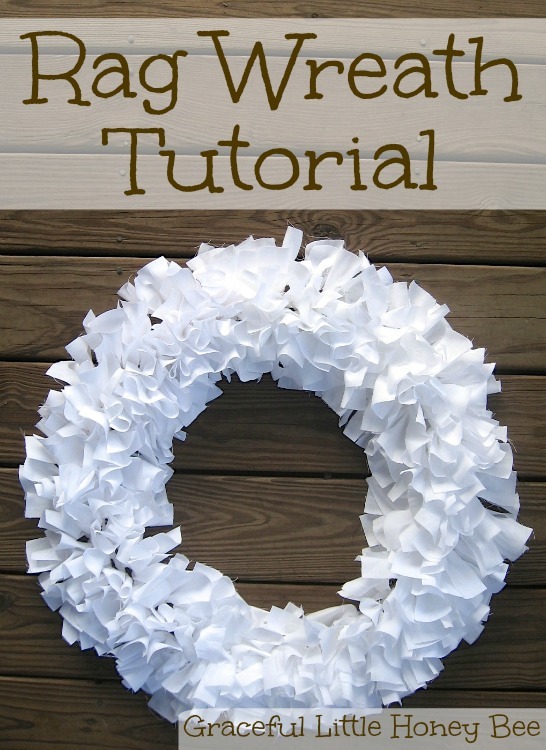 I love this rag wreath project because it’s simple and creates a beautiful full shabby looking wreath. Plus, you can keep this project frugal by reusing old sheets or any fabric that you like. Keep in mind that you want the fabric to be a medium weight so that the wreath holds it’s shape and doesn’t have a droopy look to it. I used regular quilting fabric. Feel free to change things up and use multiple fabrics or patterns if you would like. My wreath is currently in our master bedroom, sitting on the top of a bookshelf, but I have big plans for it in our new house. I want to hang it in the living room over an old window for a rustic look. What do you think?? 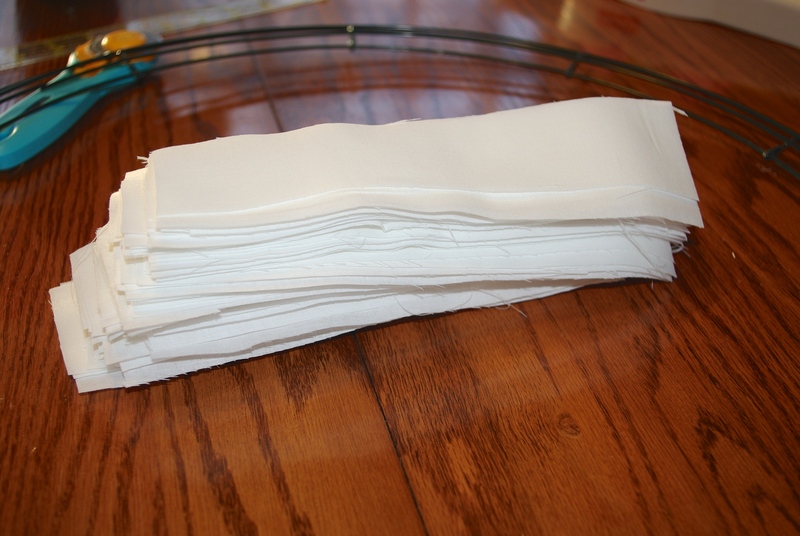 Step 1: Cut fabric into roughly 1.5″ X 9″ strips. Measurements do not need to be exact. You can make your strips smaller or larger depending on your taste. 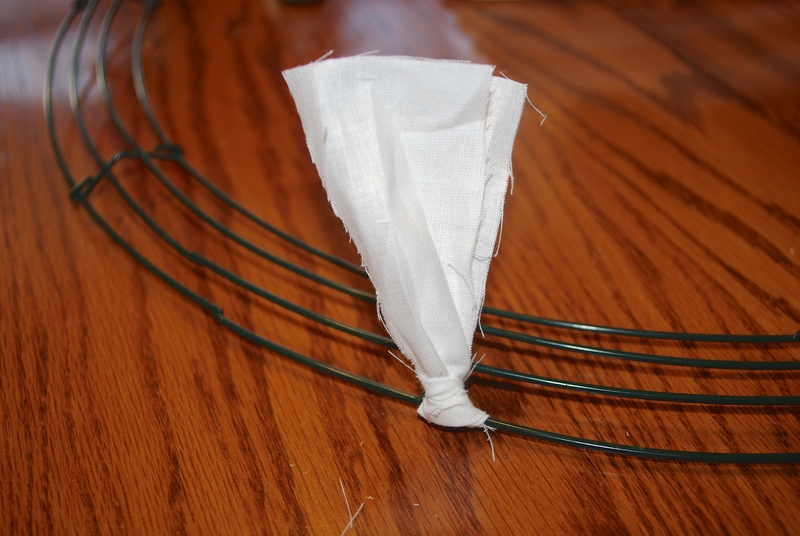 Step 2: Take one piece of fabric and fold in half placing under the wire. 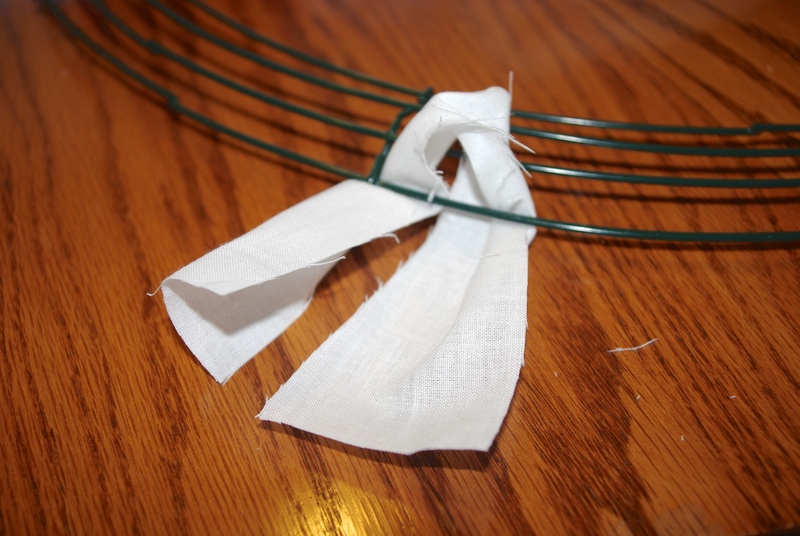 Step 3: Pull ends through loop and tighten to create a knot. Step 4: Repeat steps 2 & 3 until wreath is full. How easy was that?? I love simple projects like these that have such a beautiful result. I can’t wait to see how mine looks hanging on the wall when our new house is completed. Have you ever made a wreath before? I’d love to know! Do you think this would work with red burlap? You could try it, but burlap ravels really easily so it would probably be really messy. I made it with red burlap. Turned out beautiful, but it was MESSY!! I'm making 3 more for family members without burlap though! 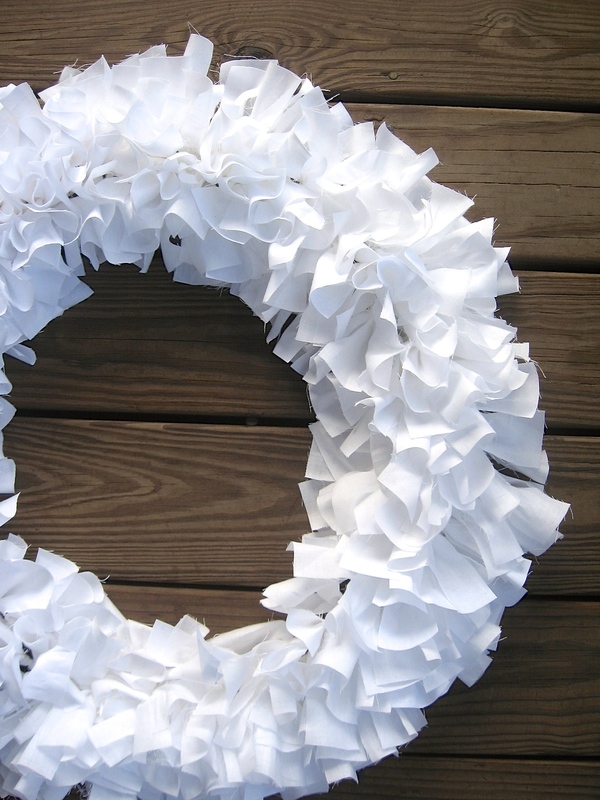 Many moons ago, we made these wreaths out of heave plastic white, clear, or green trash bags cut. These could be used outside. I like the material idea though. What a lovely clean design. Thank you for the inspiration. All I need to do is source the wreath wires! You should be able to find them at Hobby Lobby or Michael's. love this wreath, can you add emellishment s on it and hat kind. Thanks for the great tutorial! I've been wanting to learn how to make these and had no idea that it was so straightforward! I have lots of ideas for some great wreaths! Your wreath is beautiful. This is the best tutorial I have seen. 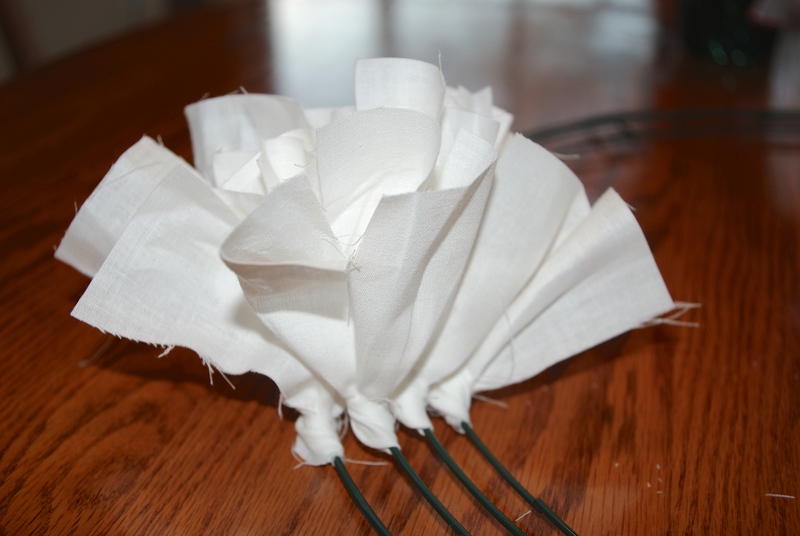 I have made rag wreaths before but I knotted the pieces. The way you have done it makes it look much neater. I am certainly going to have a go. Hi! Where do you get the wire frame for the wreath? I love it and can't wait to try it out? Any craft store will have it. I got mine from Hobby Lobby. You can also get 14.5” wire wreath forms at Dollat Tree. I use them all the time and they are a great value. You made this look easy. Am going to start on a wreath for fall. I think it's important to mention that the fabric should be cut on the bias to prevent fraying. If you don't mind the frayed look, then just cut across fabric. Hi, What size was the wreath frame you used in the video please. I have made 3 wreaths. Can't wait to try this. I did make a rag wreath many years ago. Our Sunday school "adopted" a wing at a nursing home. A friend of mine decided that we needed to make a wreath for each room. She bought fabric, straw wreaths. She set the date and told everyone to bring a covered dish and a Philips head screw driver. We prayed for the recipients, our food and fellowship. We ate and were divided into fabric cutters and fabric appliers. I had a great time twisting the fabric on the end of the screwdriver and shoved it int the wreath! I have no idea how long to cut the fabric. I'm hoping it will come to me like the great memory just did! Sorry! I didn't mean to write a novel to a simple question! I got my supplies! Going to make a 20 " whit wreath. Thank you for your video. Beautiful. Do you use a double knot or is that necessary?